Small-scale, temporary projects can have a widespread, lasting impact on our communities and our perceptions of change. Our roadways take up a large amount of space, and for a logical reason: in cities, they are used to transport lots of people to and from work, the store, the doctor, school, or any number of places, in a variety of ways. They are a vital part of our urban systems. That said, these large public spaces right out our front door are often underutilized and not designed in a way that recognizes their multimodal users. We all have different ways that we prefer to get around, and while we need space for personal vehicles, we also need to recognize that roads have long been designed with a focus on drivers and less consideration for other ways that people prefer to travel, be it via bus, bicycle, foot, or other methods. This often means that more space than necessary is allocated to travel lanes or on-street parking, leaving less space for other users and uses, and leading to unpleasant environments and unsafe conditions. Take, for example, what we can observe from the phenomenon of “sneckdowns.” A sneckdown refers to a neckdown (a traffic-calming element) formed not out of concrete, but out of snow – which is particularly adept at marking traffic patterns. Sneckdowns are a natural reflection of just how much (or, rather, how little) space cars actually need. They demonstrate how much more space we could devote to pedestrians or other infrastructure that would provide a safer, more pleasant right-of-way (which generally encompasses not only the travel lanes, but also the sidewalks, adjacent bike paths, etc). It’s not always the case that we have too much space dedicated to traffic lanes, but it is rare that space has been perfectly allotted. Traffic engineers have expert knowledge of how much space is needed for vehicles to move efficiently. Unfortunately, other road users are not always taken into account, and the needs of the entire right-of-way (including the need for adequate sidewalks, shade, and accessibility) are not always examined. What happens when we consider reallocating space to fix public space design issues or improve quality of life in a neighborhood? If everyone (the local DOT, decision makers, business community, and general public alike) agrees that there is a problem and can agree on the best solution, that’s great. But it rarely happens. If given the chance, few people would vote against creating streets that are more inviting and safe for all users – until they are faced with a reduction in street parking or loss of a travel lane. They fear the real or perceived trade-offs that come with these changes, and they have a hard time weighing the benefits of improving pedestrian and bicycle infrastructure against a potential increase in commute times or the threat of having an even harder time finding a parking spot. I understand these concerns. I, too, often have to circle my neighborhood to find a place to park. Sometimes my bus gets caught in congestion, and heavy traffic is no more fun to navigate on a bicycle than in a car. I certainly don’t want to make the problems worse. However, an important part of my job is helping communities capitalize on the opportunity to think creatively and reimagine a place as it could be, not as it is. Communities and neighborhoods evolve. The urban landscape can change dramatically in a short span of time. Changes are most readily seen in the buildings and other structures that shape the urban form, while streets and other public spaces are slower to catch up. What if they don’t have to be? The easiest, most effective way for people to understand the potential for a place (be it the road in front of their house or the empty lot down the street) to look and function differently is through actually showing them, using temporary installations rather than solely relying on renderings or precedents. Obviously, it is not always possible to do this, especially for large projects – a temporary installation of a roadway alignment along an entire corridor would be rather expensive – but there are many examples of how people have taken an idea and run with it at a variety of scales. The projects don’t have to become permanent installations to provide benefits. They can get people thinking differently about their surroundings, and reveal the potential to transform a place quickly and cheaply. They also provide a fun social activity for residents, and can bring them together to discuss their hopes and concerns for their neighborhood. 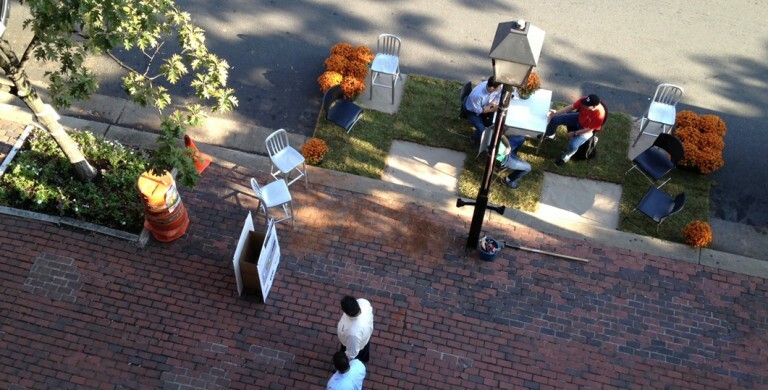 PARK(ing) Day provides a great example of temporary, small-scale changes that make a big impression. It is an annual event that encourages people to pay the meter and transform a parking space into a small park, or “parklet.” The idea was born in 2005, when Rebar design studio converted a parking space into a tiny public park using a roll of sod, a potted tree, a bench, and some safety bollards. Now, PARK(ing) Day has thousands of participants (including RHI) all over the globe, in big cities and small towns. People flock to the installations with interest, questions, and ideas for other parklets. The transformation of just one parking spot can really change the entire dynamic of a street, especially when it is a street that usually has no seating areas or little vegetation. On a larger scale, Better Block projects aim to re-imagine an entire block, or more. They use temporary, movable structures and objects (including paint, pallets, and plants) to create new spaces on and along the street. Traffic still passes through the area – just differently. Better Block started in Oak Cliff, Texas in 2010, with a locally-driven project that activated not only the right-of-way but also the adjacent vacant buildings. The project won the 2011 National ASLA award for Communications, with the jurors calling it “a 21st-century version of what the Chicago World’s Fair did in 1893.” Since 2010, Team Better Block has partnered with local organizations and communities to design Better Blocks all over in the U.S., as well as some sites in Canada and Australia. Others are using similar “pop-up urbanism” efforts to shows local leaders and community members how changes to the street could look and function. Minneapolis Bicycle Coalition installed a temporary protected bicycle lane, complete with intersection improvements to maximize safety. In Downtown Cleveland, students designed, installed, and assessed the success of a temporary complete and green street. New York City’s “Bowtie” is a large-scale, very clear example of how a temporary project was able to prove itself worthy of permanence. Officially called Green Light for Midtown, the pilot project converted five blocks of Broadway (from Columbus Circle to 42nd Street and from 35th Street to 26th Street) into two pedestrian plazas, and used a set of measures to define the success of the pilot based on mobility, safety, and other factors. According to NYC DOT’s Green Light for Midtown [pdf] report, the pilot had immediate positive effects on air quality, particularly in the project area but also throughout Midtown. There was increased traffic on 6th and 7th Streets, but injuries to motorists and passengers went down a huge 63%, and injuries to pedestrians decreased by 35%. Maybe even more importantly, 75% of the surveyed residents enjoyed the changes. Now, the city is making the plaza permanent. The NYC project isn’t the only pilot or temporary project that led to a permanent installation. In Austin, Texas, a PARK(ing) Day installation was turned into a pilot parklet to test how a permanent conversion might work. Better Block projects have led to the installation of permanent bike lanes in Memphis and Fort Worth, and several of the pop-up businesses that were created for Better Block events have become long-term ventures. The City of Santa Monica used a temporary installation and a festival as a public workshop for a greenway project – the final design of which was heavily shaped by the input they received while residents tested out the new streetscape elements. Even sneckdowns – which are basically unintentional pilot projects, with drivers staying within the lines that those before them have created – have led to street improvements that shorten pedestrian crossing distances and calm traffic, without drastically impeding the movement of vehicles. Most of these projects are driven from the ground up, as their design certainly should be. But there’s nothing stopping urban designers and planners from using these strategies to test concepts with the community before they commit to long-term changes. We spend a lot of time talking with community members about the changes they’d like to see. By working with them to design a solution that implements these improvements – and mitigates potential negative impacts (loss of parking, traffic diversions, etc) – we can use temporary projects to quickly discover whether the idea has the potential to work on a large scale. It is particularly helpful to complete an assessment of measurable outcomes (increased pedestrian traffic, reduced traffic accidents, increased business revenue, etc) that have been vetted by the general public and decision makers, to quantify the results of the project. If you’re considering improvements that could be easily demonstrated via a temporary project – curb extensions, bike lanes, valet parking, food trucks, more street trees, etc – why not take a chance and try it out before you and your community commit to a solution? It doesn’t have to be expensive, or time-consuming. 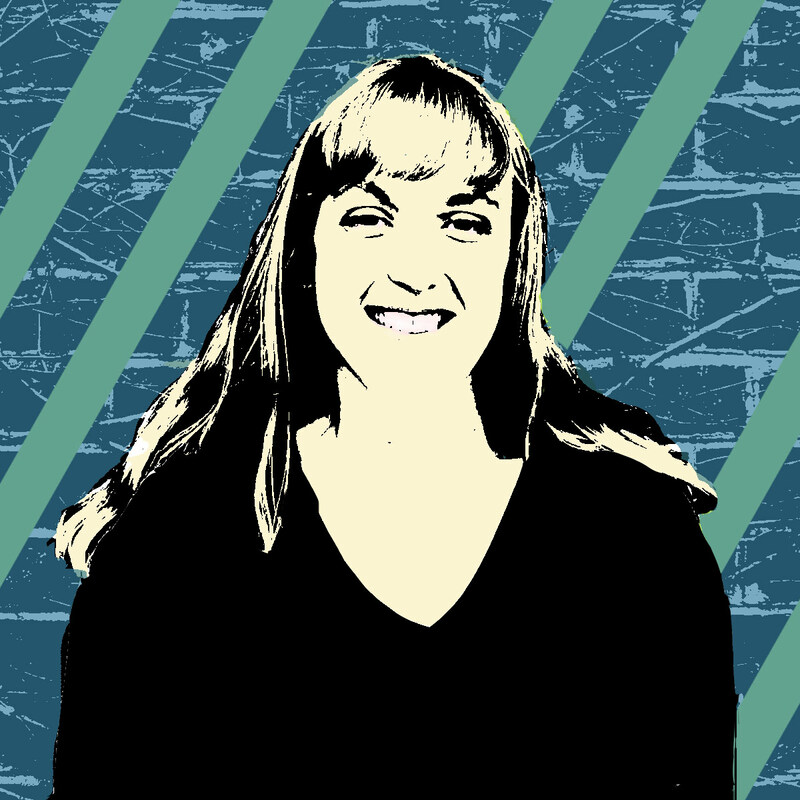 In the words of Janette Sadik-Khan, Commissioner of the New York City Department of Transportation from 2007-2013, “if you’ve got a big, controversial project, think about lawn chairs.” If you need some pointers, Better Block has published and spoken about their strategy. 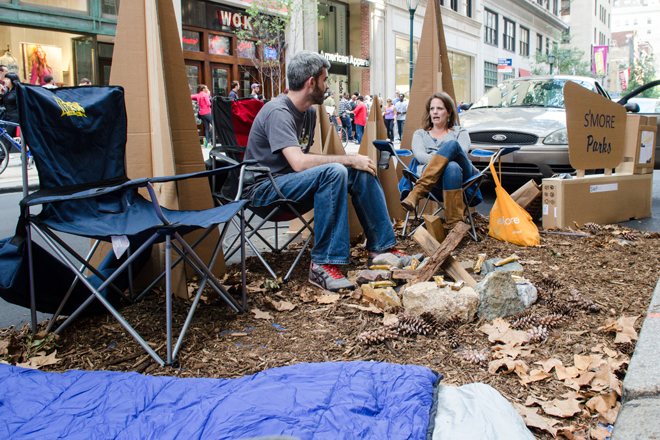 Rebar has published a guide to PARK(ing) Day, and NACTO has a parklet design guide. Many of the other projects referenced above have also published their results. If your experiment works, great! Consider whether it would work well as a permanent installation. If it doesn’t work, you’ve spent a lot less time and money to find out than you would have with a larger undertaking. Figure out what went wrong. Change it. Try again. Your community is evolving and your ideas can, too.